BEIRUT/MOSCOW — Russian warships in the Mediterranean Sea fired cruise missiles at targets near Aleppo on Friday, a further sign of Moscow's broadening military effort in Syria days after it began to fly bombing missions from an airbase in Iran. Russian air power had helped Syrian President Bashar Assad make steady advances against rebels seeking to oust him since Moscow's intervention a year ago, but a recent insurgent advance in Aleppo has checked that momentum. "The Syrian regime would be well advised not to interfere with coalition forces or our partners," Pentagon spokesman Captain Jeff Davis said. 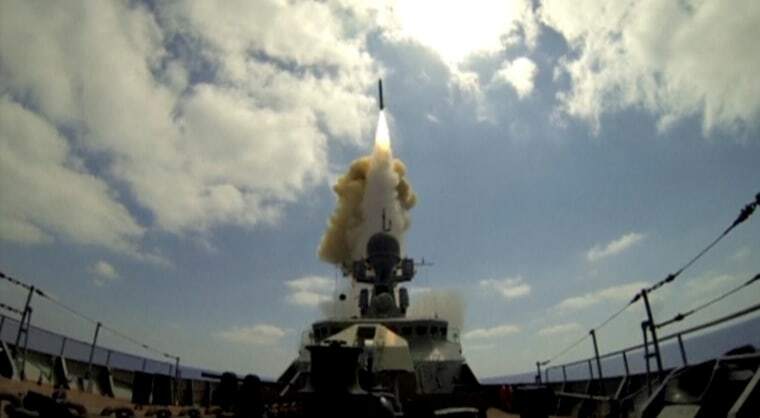 Russia's three cruise missile launches were its first against targets in Syria from the Mediterranean, with previous ones made from its Caspian Sea fleet. On Tuesday Russian bombers began flying missions in Syria from Hamedan air base in Iran. Russia's Defense Ministry said the strikes targeted the Islamist militant group Jabhat Fatah al-Sham, known as the Nusra Front until it broke formal ties with al-Qaeda last month before playing a big role in the sudden rebel advances in Aleppo. The upsurge in fighting and airstrikes in and around the city, split between government-held west and rebel-held eastern sectors, has prompted growing international concern, galvanized by pictures on Thursday of a dazed, bloodied child. The plight of civilians in Aleppo has been aggravated in besieged areas by dire shortages of basic goods, leading the World Food Programme to warn of a "nightmarish" situation. In Daraya, a suburb of Damascus, rebels and a war monitor said the Syrian army's helicopters had dropped incendiary barrel bombs early on Friday, putting the opposition-held town's only hospital out of action.